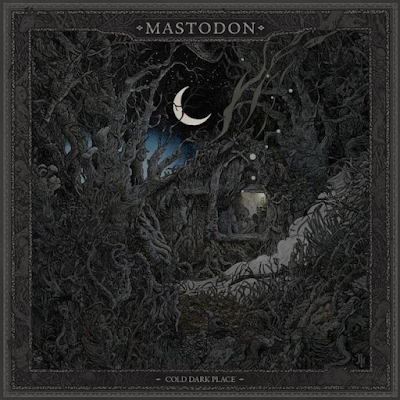 Atlanta rockers Mastodon will release a new 4-song EP, “Cold Dark Place”, on September 22. Three of the tunes – "North Side Star", "Blue Walsh" and the title track – were recorded during sessions for the band’s 2014 album, "Once More 'Round The Sun", and were produced by Nick Raskulinecz; a fourth track, "Toe To Toes", was produced by Brendan O’Brien last year while the pairing worked on their current "Emperor Of Sand" record. Fans who pre-order "Cold Dark Place" will receive an instant download of the track "Toe To Toes" on September 1. The EP will be previewed with a special series of Mastodon covers by the newly-relaunched Revolver magazine. The issue, which hits newsstands on September 12, will be available with four different covers, each featuring a member of the band; when all four covers are placed together side by side, a single image of the group is created. As an added bonus, Revolver subscribers will receive an exclusive and very limited-edition seven-inch vinyl single with their paid order. The A-side is the version of "Toe To Toes" that appears on "Cold Dark Place", and the B-side is a previously unreleased instrumental version of the track. The single will be housed in a picture sleeve featuring exclusive artwork by Richey Beckett, who also created the cover image for the EP. A behind-the-scenes video on Beckett and the making of the set’s cover art can be seen below. Mastodon members Brann Dailor, Bill Kelliher and Brent Hinds portrayed White Walkers in Sunday’s season 7 finale of the HBO series Game Of Thrones; they previously appeared in a 2015 episode and recorded the track, “White Walker”, for the show. The group will begin a fall tour of North America with Eagles Of Death Metal and Russian Circles next month.